The pair EUR/USD is traded in a positive sentiment and closed the day with an increase. The Eurozone news will show the November leading countries PMI final assessment and according to the forecasts there will be no changes this week. However, the most important event for the investors will be the European Central Bank meeting which ends on Thursday where the monetary policy fate will be decided. The pair euro/dollar was consolidating the whole last week after its decline to 1.2330-1.2350. The pair attempts to develop an upward correction was limited by the resistance level of 1.2500-1.2520 that successfully holds back the bulls onslaught. 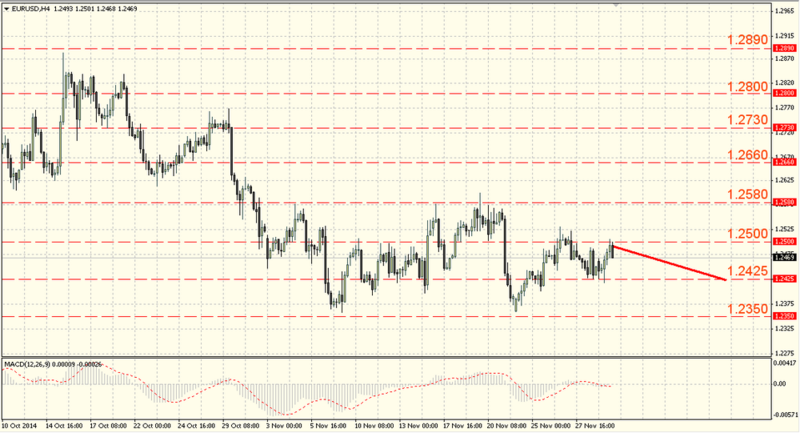 The longer the pair is trading above 1.2330-1.2350, it is more likely the base formation. 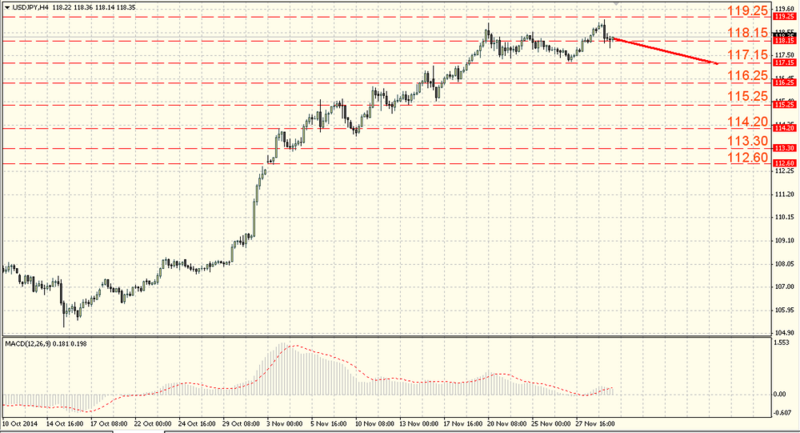 The pair ability to rise up and consolidate above 1.2500-1.2520 will signal about it. The support breakthrough risks are still preserved, but we do not forget about the false breakthrough. The British pound was the most vulnerable on the Friday trades and lost almost 90 points against the dollar. The November PMI indices are expected with a decrease in all areas – in the production to 52.8 from 53.2, in the construction to 61.2 after 61.4 and in services to 51.6 against 56.2 – it will not return any optimism to the British pound. The pair GBP/USD recovered last week, rising to the level of 1.5800-1.5820. The pair failed to consolidate above the broken through resistance around 1.5730-1.5750 and again came under pressure, it returned below the previously broken through the support levels near the 56th figure. The pound increased and broke the resistance level of 1.5730-1.5750 yesterday. 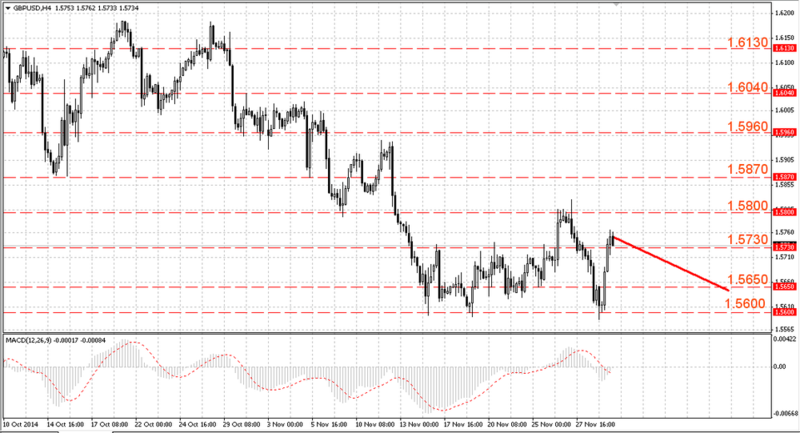 The support levels are 1.5710-1.5730, and the resistance levels are 1.5800 – 1.5820. The pair return to the 56th figure increases the consolidation phase completion by the support breakthrough, but the pound ability to keep above this level will give a reason to consider the base formation. The resistance levels of 1.5730-1.5750 and 1.5800-1.5820 breakthrough will signal about it. The decrease risks towards 1.5600 are still preserved. The Japanese yen spent the sales wave against the dollar last week. The pair slightly was corrected on the yesterday trades. The consumer price index fell more than expected to 2.9% y/y from 3.2% y/y in October when it was expected to see reduction only to 3.0% y/y. We expect the messages about the European Central Bank’s monetary policy decisions and the US labor market indicators. The pair dollar/yen was consolidating the whole last week after the rise up to the fresh highs at the level of 118.15-118.35. The mark of 116.95-117.15 supported the pair where it returned back to the above mentioned resistance. Theoretically, the bulls can be aimed at the important psychological level of 120.00 testing. The support levels: 117.95-118.15, and the resistance levels: 119.05-119.25. The inability to overcome the current resistance can lead to profit-taking, as a result we will see the larger correction. Before the US labor market the pair can be within the range of 119.25-117.15.